Story: Mister Karayel, an owner of a large enterprise was planning to fly from San Fierro to Las Venturas for a business meeting, he prepared himself, and went to the airport, upon arrival, two armed persons shows up, aiming at him, guiding him inside the plane, he was terrified, not knowing what to do, they went to the cockpit to discuss, while he sat back on the plane seats, he had a chance to survive, he called nine-one-one to inform them about the crime. 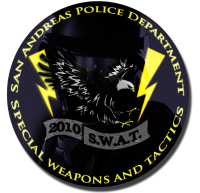 The call was recieved, and SWAT units were dispatched, Lt.Anas, Major.Crash, Captain.Silence and Pablo, they arrived to the airport, but the criminals expected cops showing up, so they stepped out of the plane and requested a helicopter and 10 millions to give them the hostage. The helicopter arrived, the criminals approached slowly, Lt.Anas shot down the first criminal before entering the helicopter, and the other was surrounded by the cops and they took him to the jail with a life time sentence with the following crimes: Armed robbery, Attempted Murder - First Degree. The hostage was released after cops doing a great job. Story: Thanks to a quick response from the SWAT group in conjunction with the ICE group and police officers. We were able to counter around 3 SR and one VIP. It was an excellent job.